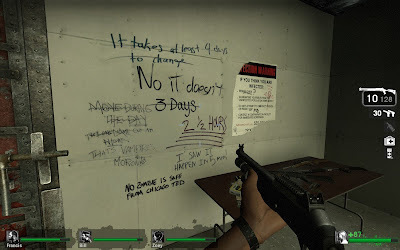 Reading all of the graffiti in the safe houses was one of my favorite things to do while playing Left 4 Dead. Not only has the fun literature returned in Left 4 Dead 2, but it looks like a type of conspiracy theory has evolved from it all. It is being reported that not only are there “carriers” of the zombie virus who are immune to changing, but that our original four heroes from L4D may actually be spreading the plague! There’s a great write-up about this theory over at Destructoid with some very thorough and well-thought arguments. Evidence points to the wall writings with talk of “immunes” in the first installment. This may have been included throughout the game to lightly explain why our heroes can be attacked and bitten but never change. 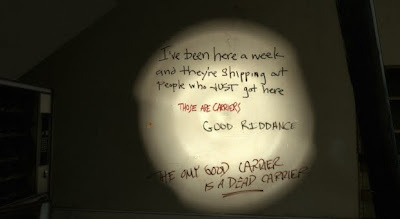 On the walls of L4D2, we are told that “Some people are carriers” and "They're immune but they can spread the infection"
More evidence to support the claim that original four are carriers refer to the man in the church changing as well as the helicopter pilot. Could they have been bitten prior to the survivors arrival? Yes. But what was it about the presence of our survivors that caused them to change immediately? A great read for anyone who enjoys the Left 4 Dead saga. Visit Destructoid to read the full article in its well-thought-out entirety.